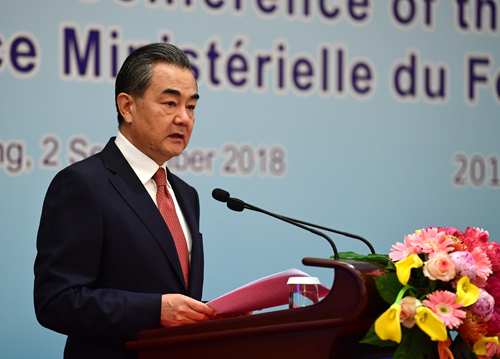 On September 2, 2018, when introducing the implementation situation of the outcomes of the Johannesburg Summit of the Forum on China-Africa Cooperation (FOCAC) at the 7th Ministerial Conference of the FOCAC, State Councilor and Foreign Minister Wang Yi pointed out that the fundamental purpose of people-to-people and cultural exchanges is to enhance understanding, integrate ideas and facilitate cooperation. Over the past three years, China and Africa have carried out 168 cultural exchange and cooperation activities, and have expanded mutual learning with people-to-people and cultural exchanges continuing to heat up. Wang Yi pointed out that China-Africa cooperation in education has witnessed various highlights over the three past years. China has trained 182,000 professional and technical personnel in Africa, providing African countries with about 40,000 training opportunities in China, over 20,000 government scholarships and more than 1,700 educational opportunities with diplomas or degrees. The "Chinese fever" is constantly heating up in Africa. China has established 55 Confucius Institutes and 30 Confucius Classrooms in 42 African countries. 11 countries including Egypt, South Africa and Kenya have incorporated Chinese into their national education system. The China-Africa cooperation in think tanks and media has continued to be deepened. High-quality exchanges and dialogues such as China-South Africa high-level dialogue on thought, China-Africa high-level dialogue on poverty reduction and development, China-Africa think tank forum, and forum on China-Africa media cooperation were successfully held. Under the framework of the China-Africa Joint Research and Exchange Program, the two sides jointly implemented nearly 100 research projects and seminar projects. With continuous and smooth implementation of the China-Africa Press Exchange Center program, the Chinese side has trained more than 2,500 staff of media for the African side. The non-governmental exchanges between China and Africa have been continuously improved. Over the past three years, the Chinese side has implemented 127 China-Africa People-to-People Friendship Action programs in Africa. The China-Africa Youth Gala has been successfully held for three sessions. 133 pairs of sister cities have been established between China and Africa. In recent years, the number of Chinese tourists visiting Africa has exceeded one million each year and is still growing rapidly. 30 African countries and regions have become destinations for outbound Chinese tourist groups, and more and more African countries have become new outbound tourism hotspots for Chinese citizens.